If you've got a few grand to spare, you could be a truly unique lord of the Sith. 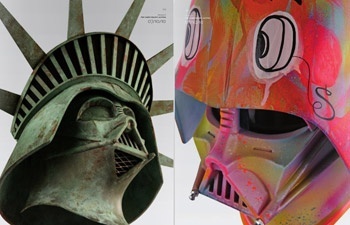 The Vader Project had a pretty simple goal: Give 100 underground artists a full-sized replica of one of the most iconic and recognizable faces in cinema - namely Darth Vader - and let them customize it however they wanted. Three years and a tour that took the finished pieces around the world later, the helmets are coming up for auction in Philadelphia, Pennsylvania this weekend. The helmets have been customized to different degrees; some have just been repainted, while others have been pretty heavily remodeled, with tongues, teeth and even the horn of a stag beetle on one of them. The artists include Shag, Marc Ecko, Tim Biskup, and Frank Kozik, as well as 96 others. Bidding will start at around $1,500 for most of the helmets, with estimates ranging from $3,000 to $20,000 for some of the more elaborate pieces. If you want to see the whole selection of helmets, you can look at full catalogue here, and if you actually have the cash to buy one of them, the auction takes place on Saturday July 10th at 12:00PM EST at Freeman's Auction House in Philadelphia, Pennsylvania. You can visit the auction house's website here.